Cooking is one of the leading causes of home fires in Escondido. Do your part to prevent burns and cooking fires in your home. Pay attention to your cooking. Don't overheat grease. If you have to leave the stove to answer the phone or doorbell, turn off the heat. Taking a spoon or hot pan holder with you will remind you that you're cooking and need to return to the kitchen. Never leave anything cooking on the stove overnight. 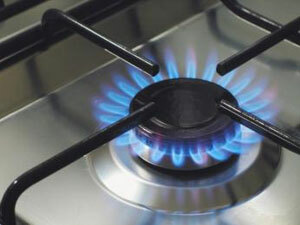 Turn all pot and pan handles toward the center of the stove to prevent accidental overturning. Keep combustible items like napkins, towels, and trash away from the stove. Never use the oven or oven handle for storage. Make certain that curtains cannot be blown by the wind into a flame or other heat source. Avoid wearing frilly clothing or long, floppy clothes while cooking. If your clothes catch on fire, stop where you are, drop to the ground, and roll until the flames are extinguished. Keep potholders handy and use them, even when removing food from the microwave. In case of a frying pan fire, slide a lid on it and turn off the heat. If a lid is not available, use a cookie sheet, wooden breadboard, or larger pan. Never attempt to move a pan that is on fire and never use water, salt, or flour on a grease fire. If you have a fire extinguisher handy, know how to use it before the fire starts. Fire extinguishers are for small fires only. If you are unable to extinguish a fire easily, leave the house immediately and call 9-1-1 from a neighbor's phone. Pesticides, pool chemicals, and flammable liquids can be fire and life safety hazards. Excess material should be disposed of properly. For information on hazardous waste disposal, see Household Hazardous Waste on the City of Escondido's Web site.